Severe Drought, we shared the farmer’s horror as Wisconsin’s cherry crop failed! Dan bought what cherries he could. The Apple crop fared better. Then joy! A grand Wisconsin cranberry harvest. What will Dan brew with Apples, Cranberries and Cherries? Oh my! 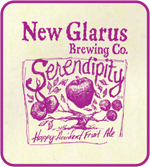 You hold the happy accident of Wisconsin’s favorite fruit aged in oak with an almost magical wild fermentation. Serendipity is a wondrous celebration that sparkles your senses and dances across your palate. A kaleidoscope of flavor discovered by accident in a sour ale!